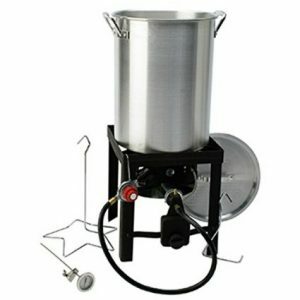 Are you looking for a reasonably priced complete turkey frying kit? Then this one from Kamp Kitchen should be at the top of your list. Read our buying guide packed with information the details you need to help you decide if it’s right for you. This Deep Fried Turkey Kit is an outdoor turkey deep fryer than runs on propane. This kit includes everything you need to deep fry a turkey outside except the propane bottle. 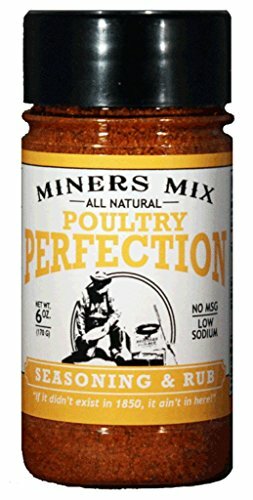 This is a convenient way to get started with deep frying turkey, instead of trying to piece all the parts together yourself. Priced very reasonably, this Kamp Kitchen Deep Fryer makes an affordable choice for people looking to deep fry turkey for their next family event. Deep fried turkey is moist and juicy on the inside and crispy on the outside. Most people who taste it for the first never go back to roasting it in the oven. Your friends and family will want to keep coming back for more every single holiday celebration! The best part about this item is that it frees up oven space when space and time is tight. You can roast veggies, and cook desserts with ease for your next Thanksgiving feast without having to worry about timing and oven space. 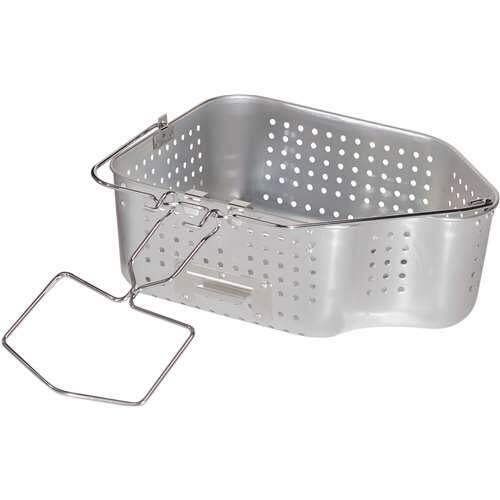 The Kamp Kitchen Fryer comes with an aluminum pot + lid, stand, burner and stand, heat shield (for wind protection) as well as turkey rack and lifter basket. The burner puts out a powerful 38,000 BTU, meaning that your oil will heat up quickly and maintain the oil temperature once you put the turkey in. A small-medium size turkey will deep fry in under an hour easily. 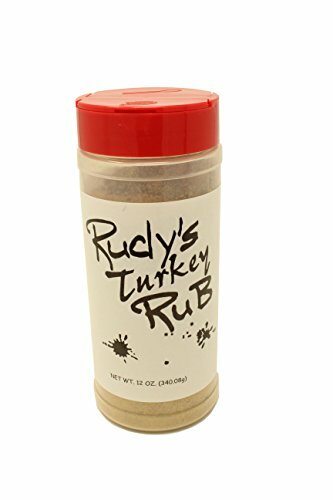 This is a game-changer on that busy Thanksgiving day! Be a slave to the stove for hours no more. The aluminum pot-the better quality (more expensive) ones are made of stainless steel, which makes them more durable and easier to clean. Lack of power (38,000 compared to something like the Eastman Outdoors Turkey Fryer with 65,000 BTU’s). If you’re looking for an extremely economical kit that will deep fry a turkey outdoors, this Kamp Kitchen set is perhaps it. There are very few complete kits that are so cheap, including shipping (this King Kooker Turkey Fryer is another one). Perhaps you’re not sure that it’s really for you and want to test it out? It could make sense to buy a cheap kit like this one and see what you think. We understand that you might not want to drop $200+ on a more expensive set-up with a stainless steel pot, only to find out that it’s not for you. 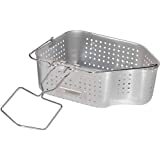 Although the Kamp Kitchen turkey fryer kit is not that durable, it’ll work for at least a few times. It’s maybe enough for you and the price is usually well under $100. Buying the pot, stand and fryer separately will cost you at least twice that, at minimum. Are Cheap Turkey Fryers Worth It? A common question that we get from readers is whether or not cheap turkey fryers are worth it. Kamp Kitchen, a complete kit is the cheapest that you’re going to find. But, are they worth it, or just a waste of money? Our short answer is that it depends on your situation! 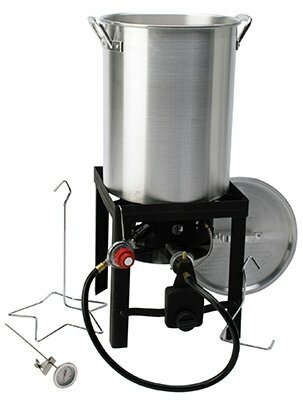 If you’re hosting a big party or family gathering and aren’t worried about your kit lasting for years or decades, then consider a cheap turkey fryer such as this one. The aluminum pot is not as durable as a stainless steel one, but you just have to be careful with it. Set it carefully onto the rack and ground, and store it in a place where it’s not going to get bumped around too much. Another negative is that his turkey fryer has a BTU rating of only 38,000. This means that it will take quite a bit longer to heat the oil up than with some of the other kits. However, if you’re patient, and particularly if you live in a warmer climate where you’re not fighting cool air temps, it should be no problem. 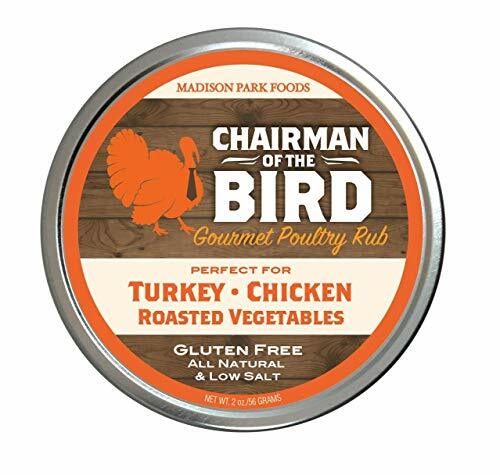 If you’re the kind of person who likes some good value for their money, then consider a more expensive deep fried turkey kit. Or, if you’re impatient, the low turkey fryer BTU rating might make you a bit crazy. Consider a deep fried turkey kit with more power! This one from Bayou Classic is a nice choice. Bayou Classic is certainly one of the best brands in the business. 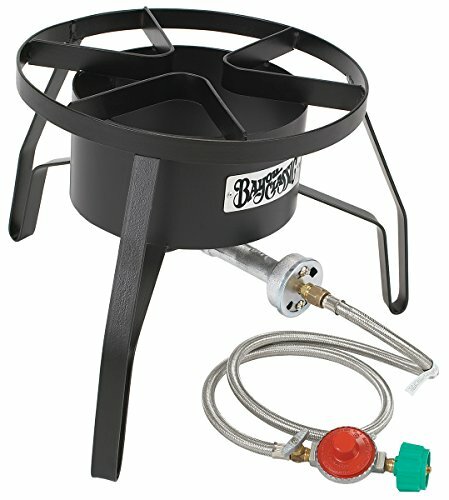 Is there a Better Option for a Turkey Fryer? 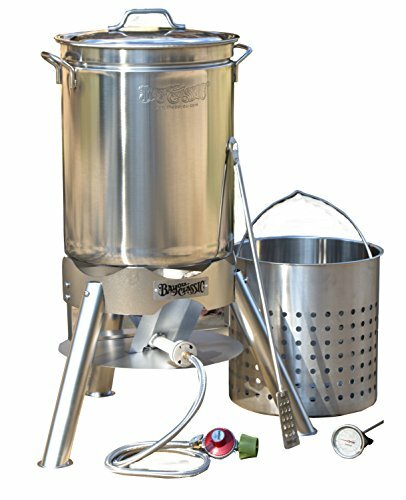 The main difference between turkey fryer kits under $100 and those over $100 (like the Eastman Outdoors Turkey Fryer Kit) is the pot. The cheap ones are made of thin aluminum which can be quite difficult to clean and not so durable. The stainless steel ones clean very easily as well as last for decades. The other major difference is the amount of power that the burner puts out. The cheap kits have about 1/2 the power of the more expensive ones which means that your oil will take longer to get up to temperature. Which turkey deep fryer is best for you? If you’re looking for a turkey fryer for a single use, then this Kamp Kitchen set is an obvious choice. If you’re looking for a more durable kit to use multiple times over years, consider one of the more expensive ones. What about an Electric Turkey Fryer? 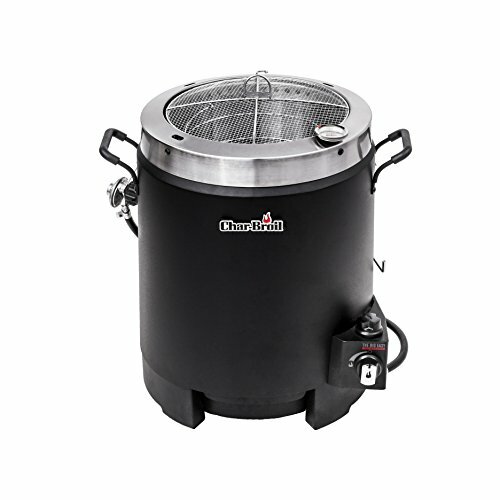 If you’re looking for an electric turkey fryer that doesn’t run on propane gas, then you’re going to want to check out this one from Masterbuilt Butterball. It’s in indoor digital turkey fryer that comes in a various sizes to accommodate different weights of turkeys, up to around 20 pounds. Some people in cold climates prefer an indoor fryer because it can be difficult to fry a turkey with an outdoor cooker when the temps are sub-zero. It’s also a struggle to get your oil up to the correct temperature in situations like this. 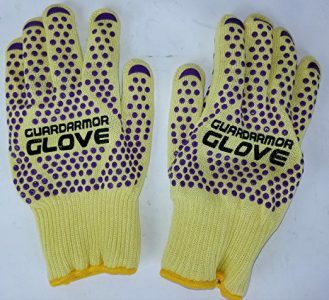 It’s one of our top-rated products here at this website. 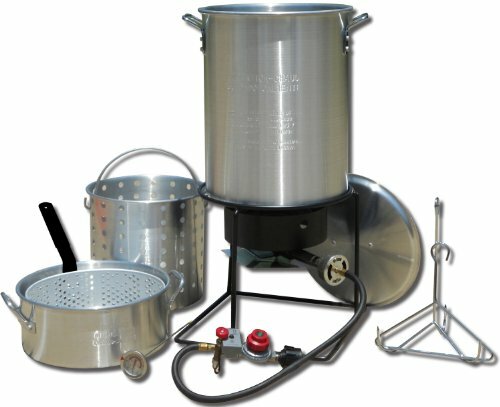 What are your thoughts on this Turkey Fryer Kit? Leave a comment below and let us know what you think. And don’t forget to share this on Facebook, Twitter, or Pinterest.